It all started with this guy. This sturdy young man is Florentine Erwin Kellogg and he was an American pioneer. Born in New York in 1816, his family moved to the wilds of Morgan County, Illinois in 1818, where they were the first white family to settle. He grew up a true frontiersman, and in 1840 he went with his brothers to the Rocky Mountains prospecting for silver and they had many narrow escapes from hostile Indians. In 1846, he decided to move to California. Florentine, his wife Rebecca, their three small children, his youngest brother Benjamin,and their Newfoundland dog named “Old Buck” started for California in March of 1846 with 375 other emigrants. The journey was very difficult and it lasted seven long months, but by Fall they were settled in Napa Valley. Florentine bought 600 acres, built a beautiful farm and they made more babies. Early in the Gold Rush, Florentine and his brother struck a “pocket” of gold worth over $1,000, but farming was his true calling. In 1848 he planted one of the first vineyards in Napa Valley and was the first Napa Valley farmer to make shipments of grapes to San Francisco. He was also one of the first to plant English walnuts in California. The Kelloggs lived there happily until 1871, when Florentine sold out and headed south. In 1872, he arrived in Goleta, where he would spend the rest of his days. Florentine Kellogg bought 20 acres across the San Jose Creek from Joseph Sexton’s nursery. Florentine was a large chested, powerful and athletic man. At mid life his running broad jump was 18 feet, he could take a 72 pound weight in each hand and put them together above his head, and he could lift 1,000 pounds. He was an all around mechanic and very inventive. An excellent reader, he was fond of history and poetry, he never touched liquor or tobacco and was known for his generosity. He built a large house at 170 South Kellogg Avenue where Goleta’s Jonny Wallis Park is today. His inventiveness was apparent on his tankhouse that featured a vertical louvered windmill, the first in Goleta. Joe Sexton copied Florentine’s Vertical windmill, but eventually they both switched to the conventional fan type windmill. Florentine’s son Frank later wrote a biography of him, that included the following descriptions: He was a man of high moral character, a dedicated churchgoer, devoted husband and loving father. He and Rebecca had 7 children that grew up to be upstanding citizens. A devout Methodist, Florentine built the first permanent church in Goleta on Chapel Street, personally paying for much of the construction. He was a hard worker, very prosperous, and despite overall good health, his life was ended in 1889 by cancer in his right lower jaw. In 1877, Florentine bought an additional 60 acres south of Hollister Avenue and east of Ward Drive from T. Wallace More (above) for $150 an acre. More didn’t want to sell the land, but he was desperate for money for a legal battle that would soon cost him his life. Kellogg gave this acreage to his son Frank, who would do great things with it. Franklin Erwin Kellogg was born in Napa Valley in 1851, the 5th child of Florentine and Rebecca. He graduated from college in Illinois in 1872 and then studied law for one year in Missouri. Frank then returned to California to begin his career as a teacher. In 1872, Frank married Sarah Foster. 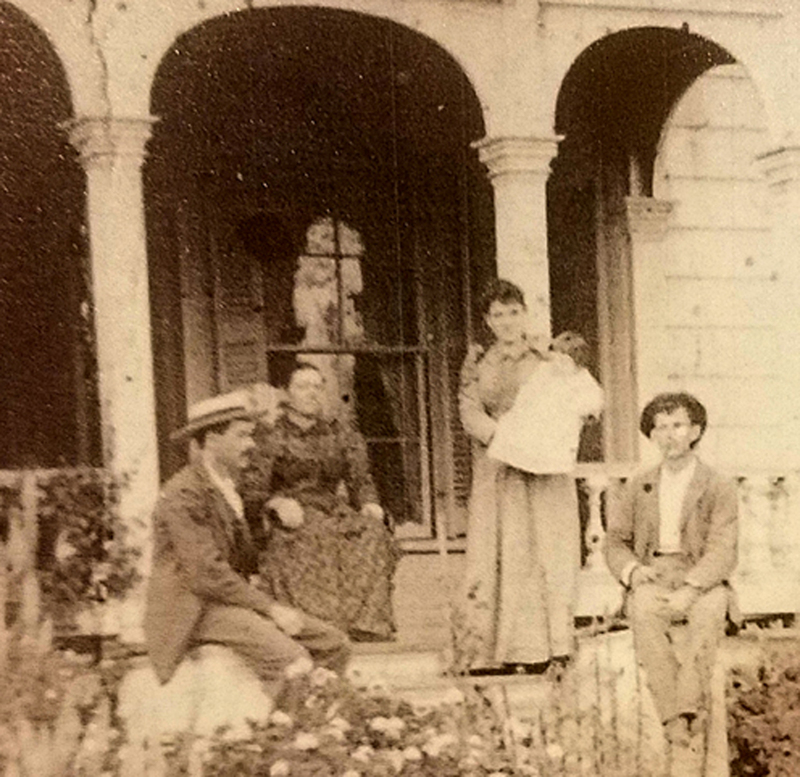 They moved down to Goleta in February, 1877 to run the 60 acre farm his father had bought from More. Frank planted English walnuts, beans and pampas grass and in 1882, he started the Goleta Dairy that was a very successful business for years. In 1889 he turned it into the first creamery in Santa Barbara County. Located on the south side of Hollister, east of Ward Drive, Frank Kellogg’s Dairy and Creamery was a Goleta landmark for years. The tall smokestack on the boiler room was visible throughout the Goleta Valley. Kellogg’s big churn was powered by a horse on a treadmill for years, until it was replaced by a steam engine. South of the creamery were milking barns and corrals for his 75 dairy cattle. But he also bought milk from all the local farmers to make more cream. Every morning around 9 the local farmers would line up in their wagons for their turn to unload their milk cans. Then Kellogg would load his wagon up with fresh cream, milk and butter and make deliveries to the Santa Barbara markets. He turned out 150 pounds of butter a day, and his operation could handle the milk and cream needs for the entire area. In all, a very successful business serving the community. Since the railroad ended at Ellwood for fourteen years, there tended to be a lot of hobos hanging around Goleta. Locals learned to send the guys asking for handouts over to Frank Kellogg’s dairy, where they could get a meal if they chopped wood for the boiler house. In addition to running the Kellogg Dairy and Creamery, Frank was the popular teacher and principal of Rafaela School from 1877 to 1887. In 1888, Frank partnered with Clio Lloyd to start the Kellogg Lloyd and Co. Real Estate and Insurance Brokers. They set up shop at 839 State Street. We’re not sure how long this lasted because all we can find is this photo. But we would guess all that beautiful produce was grown on Kellogg’s farm. Look at the size of those pumpkins and pears! Clio Lloyd went to the same Methodist church in Goleta as Frank, and he became Mayor of Santa Barbara in 1909. In 1896 Frank Kellogg was instrumental in creating the Santa Barbara County Walnut Growers’ Association. He built the first walnut packing house near his creamery. For a small fee he bleached, sized and sacked the walnuts for shipment. The creation of the Association eliminated the middle man, and Goleta growers got more money for their walnuts. In his 20 years as secretary of the Walnut Association, Kellogg sent out more than $2,000,000 to walnut growers in the cooperative. In 1897, Frank Kellogg and Steven Rutherford financed an oil well operation in Las Armas Canyon where a local geologist had predicted they would strike it rich. They drilled to 1,000′ deep before they gave up and called it a duster. Thirty years later, in almost the exact same spot, a well was drilled down to 3,500 feet and gusher erupted 100,000,000 barrels of quality crude oil. Kellogg and Rutherford were in the right place but the equipment just wasn’t capable of the depth needed. They also tried unsuccessfully at Naples, where years later another large oil pool was discovered. They were just a little ahead of their time. About the same time Frank first started the dairy farm, John More had come to Goleta to take over his deceased brothers massive ranch. Frank Kellogg soon despised John More because he constantly pestered him to sell back the land that his brother T. Wallace More had sold to the Kellogg family years before. John More hated that Kellogg owned a chunk of his empire that his brother sold under duress. Of course, Frank had no desire to sell his thriving creamery, but More would not stop bothering him. In 1907, Kellogg responded jokingly to More’s constant badgering, “For $1,000 an acre, the ranch is yours.” Land was going for about $300 an acre at that time, so that was triple what it was worth. The next day, More showed up with a check for $60,000 and a deed for Kellogg to sign. Kellogg, a man of his word, had to sign away the successful dairy farm and creamery he had spent 30 years of his life working on. As soon as the sale was final, More tore down all the creamery buildings and returned it to farm land. As you can tell already, Frank had plenty of other things going to keep himself busy without the dairy. In addition to all we mentioned before, he was on the County Board of Education, secretary of the Santa Barbara Chamber of Commerce, he was a lecturer for the State Farmers Institute and he was on the Better Roads Committee, shown above on Hollister Avenue. He was very involved with solving the water problem in the area. He became Water Commissioner for Santa Barbara and in 1902, he proposed a dam on Mono Creek just above its junction with the Santa Ynez River. A site six miles downstream at Gibraltar was chosen instead. His influence was so great that a portion of the California Aqueduct is named after him. In 1901, Frank and his siblings donated about 8 acres of their family farm for the construction of a new train depot. The same depot on display today at the South Coast Railroad Museum on Los Carneros. It was generous, but also a wise business decision to have the depot in close proximity to his farm, creamery and walnut packing house. But it was beneficial to all of Goleta and the local economy boomed. Frank Kellogg was a dynamic individual that accomplished far more in one lifetime than most folks could do in several. He was blessed with good fortune, family and friends and he made a big difference in his little town of Goleta. Frank Kellogg passed away in 1923 and left behind a legacy as well as several successful offspring, including Erwin, who would become the Mayor of Ventura, and Elmer, who ran the Potter Farm. In 1902, the illustrious Potter Hotel was built on the waterfront in Santa Barbara attracting upscale visitors from all across the country. The magnificent hotel owed some of its success to the Kellogg family in Goleta. Frank’s son Elmer contracted with Milo Potter to start the “Potter Farm” south of his father’s Dairy in Goleta. Elmer’s farm house stood around today’s 479 Ward Drive. The 100 acre Potter Farm supplied the resort hotel exclusively with fresh meat, squabs, produce and dairy products. The Hotel’s advertising led people to believe that the farm was owned by Potter, and Elmer did borrow money from him to buy the land, but he soon paid Potter off. Kellogg kept thousands of pigeons, hundreds of dairy cattle and hundreds of pigs on hand at all times. The pigs were fed Potter Hotel garbage, and fancy Potter silverware that accidentally ended up in the pig slop was found littered about for years after the farm closed. When the telephone first came to Goleta, Frank Kellogg was one of the first in Goleta to get a phone at his place. The telephone wire followed Hollister Avenue to De La Vina Street where it could join the Sunset Telephone Company’s system. Elmer Kellogg, angered by poor service, ridiculous prices and big company arrogance, built his own private line to town. Before long, however, he had to give in and go with Sunset. All his redwood telephone poles were removed and left in a pile on his Potter Farm for years. Another thing that made Elmer Kellogg unique was he was one of the first folks in Goleta to have a horseless carriage. His chain drive Metz was proclaimed the noisiest car in the Goleta Valley. The Potter Hotel was sold around 1919 and Kellogg sold his Potter Farm in 1920. The beautiful hotel burned down in 1921 and a year later Elmer Kellogg passed away. Another notable Kellogg to mention is Frank’s older brother Philander Kellogg. He was the second born to Florentine and Rebecca. Born in Illinois in 1841, he made the long journey west by wagon train with his parents when he was a young boy. Philander came down from Napa to Goleta in 1875 and was a true farmer. He was married with 11 kids and a devoted member of the Methodist Church and did not drink or use tobacco, just like his father. Goleta had been known for its large pumpkins for years, but Philander Kellogg put “Goleta punkins” on the national map. In November 1881 he grew the all-time champion giant pumpkin, over 300 pounds. Shown here with a calf inside a pumpkin, he also hollowed one out and had his 18 year old daughter Jennie pose sitting inside of it for a newspaper photographer. The photo went viral, 1881 style, and it was published from coast to coast. Lots of mail came after that, ordering “pumpkin seeds of the type that have a pretty girl inside…..”And Jennie became a minor celebrity as “the girl in the pumpkin”. Philander lived the rest of his life in the house his father built on the San Jose Creek. He suffered from pneumonia which led to heart problems that took him to an early grave at only 43 years old. His wife and kids kept living in the Kellogg family house for years to come on what became known as Kellogg Avenue. And after all the Kellogg family has done for Goleta and Santa Barbara, they are very worthy of having an avenue named after them! Fabulous history. Many thanks. I shall read all the available history of the Goleta Valley. Ha! Finally set aside time to read another wonderful article about the history of Goleta, and in particular this one, as I abutted More Mesa for years before my recent move to the Tree Farm further up Patterson. I had worked on the EGValley Community Plan (Advisory Committee) representing Urban Ag on South Patterson so the land that Frank Kellogg built his Dairy on, from Thomas More, was familiar to me as I visited the grower John Givens many times during my research but had no idea of this connection. I had been out of town and inundated when returning so I waited until I had complete freedom to indulge in your latest history as I get so excited when you’ve completed a new one. Thanks so much for these wonderful pieces of the puzzle! Oh, and the only thing I wondered after reading through several times was who were the other children of Florentine and Rebecca, were there any girls, looks like a property next to Frank’s was owned by Leslie Kellogg and I wondered if she (or maybe that’s a man’s name?) farmed as well? Seems like a whole new article with the ensuing Kellogg line could be written as well…. How informative! And of course, it’s amazing that you are able to dig up all this information with your research. Very impressive.